AN ETZINE CAMPAIGN POSTER ON THE CENTER FOR INDUSTRIAL INNOVATION WAS found defaced on Monday. 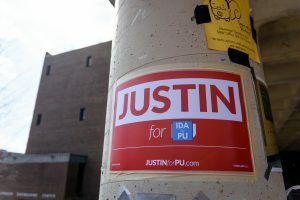 On Monday, posters belonging to president of the Union candidate Justin Etzine ’18 were found defaced with stickers distributed by president of the Union candidate Ida Etemadi ’19’s campaign. The GM Week 2018 Elections Handbook outlines an extended sign policy that applies to campaign-related material. Section 6, item 8, reads, “Respect other candidates and their campaigns. Do not tamper with or poster over other campaign materials.” The Elections Commission may issue sanctions if it determines that a violation of the Handbook has occurred. There have been no sanctions related to the defacement issued at this time. A primary election is being held today for the position of grand marshal. Polling is open from 9 am to 7 pm.